To further its dream, Martin Aircraft Company Limited has entered into an exclusive understanding with M2K Group, New Delhi, India for marketing, manufacture and sale of Marin Jet Pack & other related technologies for the SAARC region. 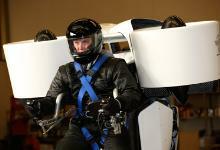 The Martin Jetpack is the world's first practical jetpack. It consists of a purpose-built gasoline engine driving twin ducted fans which produce sufficient thrust to lift the aircraft and a pilot in vertical takeoff and landing, enabling sustained flight. This Collaboration would bring a Constant development of professional management skills is critical to strengthening the aviation industry today and to building a sustainable future. This partnership will create a new globally recognized platform for aviation industry especially in India. Martin Jetpack have various advantages over a light weight helicopter , The Martin Jetpack is a vertical take-off and landing aircraft that can either be flown by a person or operated unmanned. In case of disasters the jetpack could be used to fly rescuers to areas where helicopters and planes can't get to. The operating costs are hugely lower. Compared to helicopters currently used for urban surveillance and search and rescue work, the Jetpack's hourly operating cost will be around 90% lower. The Martin Jetpack, The Ultimate Personal Flying Machine, is the result of years of input from a team of world class engineers and developers. Martin Aircraft Company has built a team of experienced staff, executives and board members with a broad background in engineering technology, the aviation industry, business development and marketing.